The use of natural fertilizers is a better option for a garden than chemical based fertilizer. The reason is natural fertilizers are better for both people and animals. One option for natural fertilizer is to apply the manure from cows. Another option is to use compost. 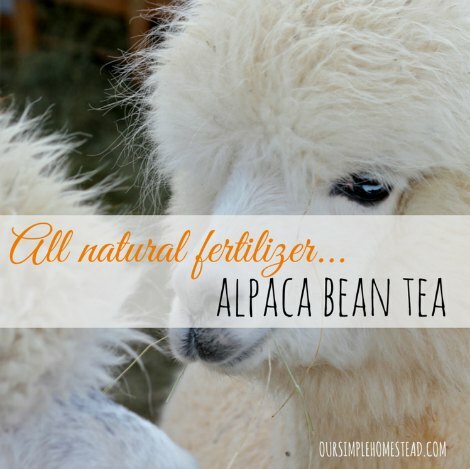 If you are planting seedlings in a garden, then an ideal solution for a natural fertilizer is to make an alpaca bean tea. Some people may raise Alpaca specifically for this purpose. However, there also are sites online to buy a package of alpaca beans to use for making alpaca bean tea. All you will need to do is know how the tea is supposed to be made to achieve the best results. Any gallon-size container can be used to make a simple batch of alpaca bean tea. The amount of alpaca tea bean tea you make depends on the number of plants to fertilize. You may use a spray bottle or a slow drip feeder to apply the fertilizer. The reason this type of fertilizer is referred to as a tea is due to the brown color that results. Your tea needs to “brew” for at least 24 hours prior to the first application. You will need to use a coffee filter or cheesecloth to strain the solid particles from your alpaca bean tea before it can be used. The reason is the leftover beans are not used as fertilizer as they have transferred their nutrients to the water during the “brewing” process. Any unused beans you have can be used as a booster for fresh potting soil. A batch of alpaca bean tea does not have a strong odor that is common with other fertilizers made from manure. This means you can keep it stored in a garage or outbuilding without having to endure a smell that is unpleasant.